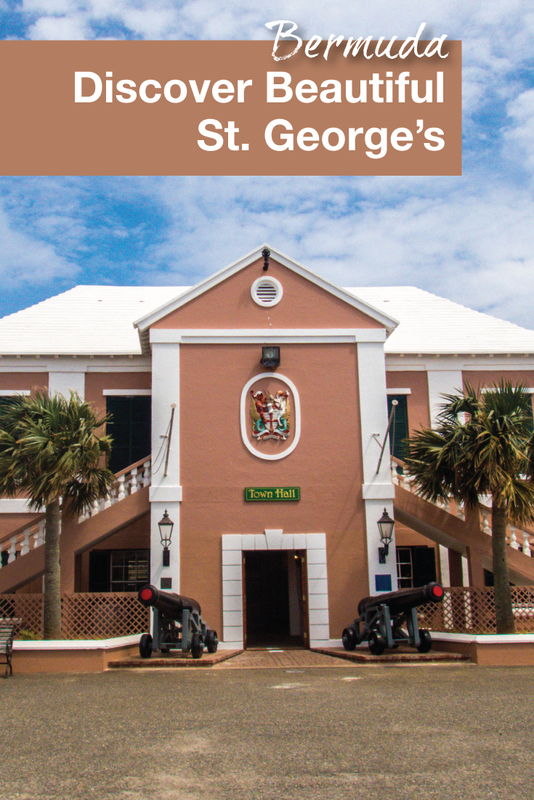 St. George Bermuda is teeming with history. No wonder the city received the UNESCO World Heritage Site designation in 2000. 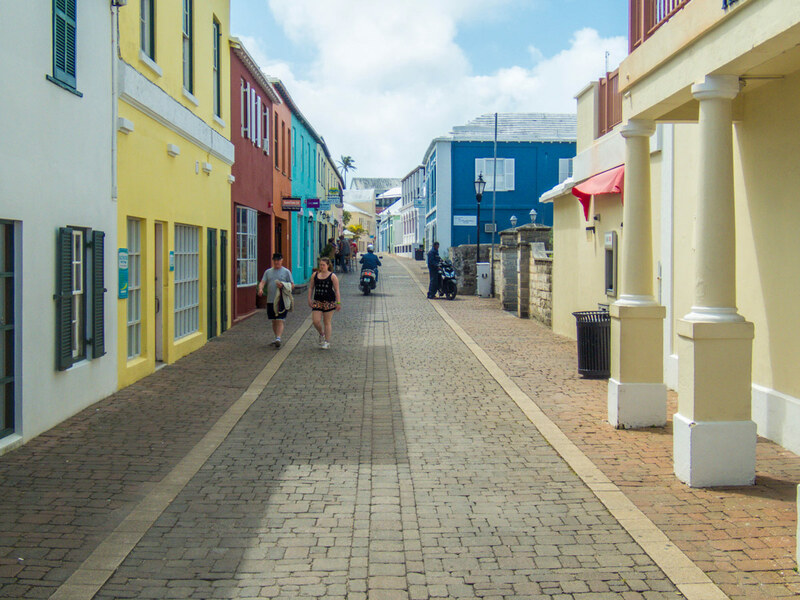 So, after having some fun in the sun exploring Bermuda’s best beaches and enjoying the Bermuda coastline from our own boat, we decided it was time to learn a little bit more about Bermudian history. We heard from locals that a good place to start would be to the formal capital of Bermuda. 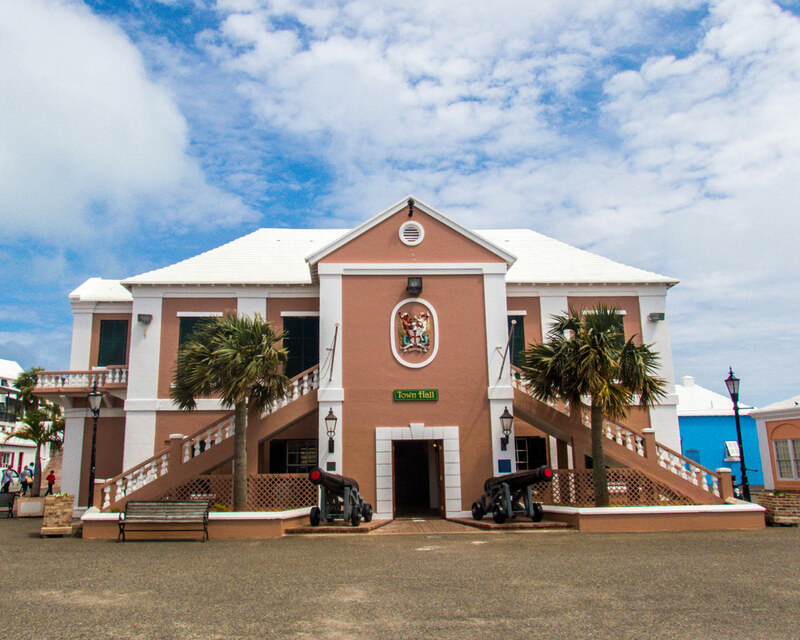 So we made our way to the town of St. George in St. George’s parish, on the easternmost end of the island. 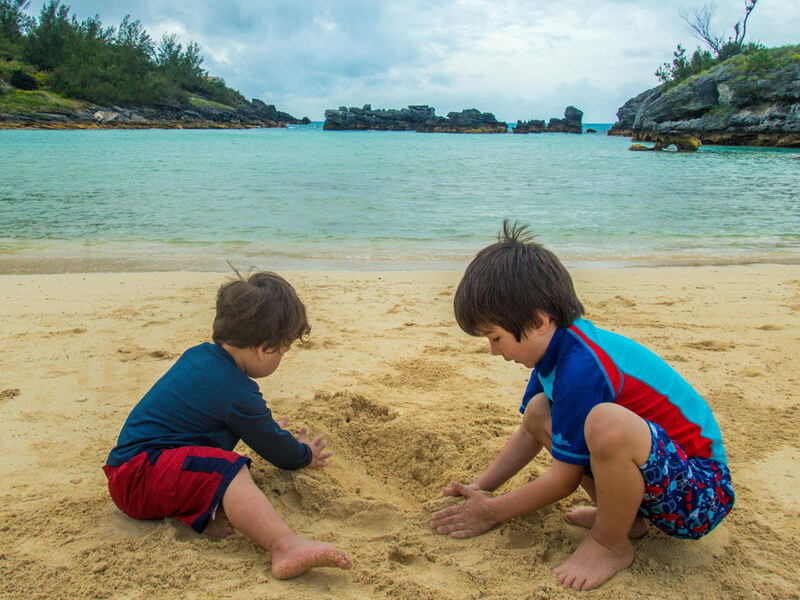 You can read about our experience boating in Bermuda with kids here. We took a ride with a local taxi guide from our hotel in Southampton Parish. The drive from the Fairmont Southampton Hotel where we had based ourselves for our stay to the eastern end of the island was relatively quick. Our taxi driver made it more enjoyable by pointing out many sites along the way including passing by St Peter’s Church. It is believed to be the oldest continually used Anglican church in the Western hemisphere. In fact, in 2012 it received the royal title “Their Majesties Chapell” by Queen Elizabeth II. Unfortunately for us, the church was not open, but the outside is still beautiful to behold. 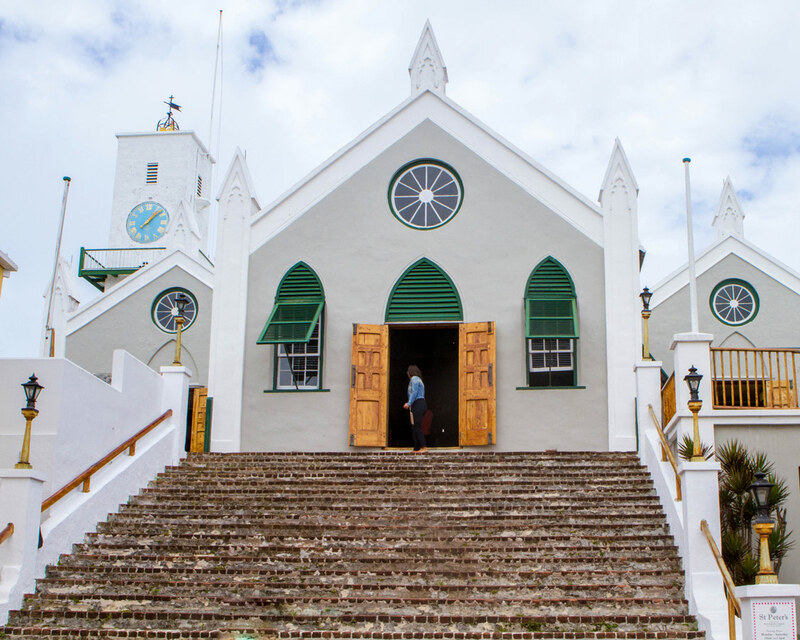 St. Peter’s Church was originally built in 1619 by the survivors of a shipwreck who made their home on the island. After a hurricane in 1697, it was repaired and re-built. We asked to be dropped off near the Town Square. So, for our walking tour, we started at historic downtown St. George. The focus point of St. George is King’s Square, also known as Town Square. For those that need information about the area, there is a Visitor’s center here. The kids loved running around the open area and playing with the canons. They also took turns standing in the pillories. Historically the pillories were used to publically humiliate and punish criminals. Periodically, there are reenactments held in the town square. Unfortunately, as we visited during low season we didn’t get to see a show. 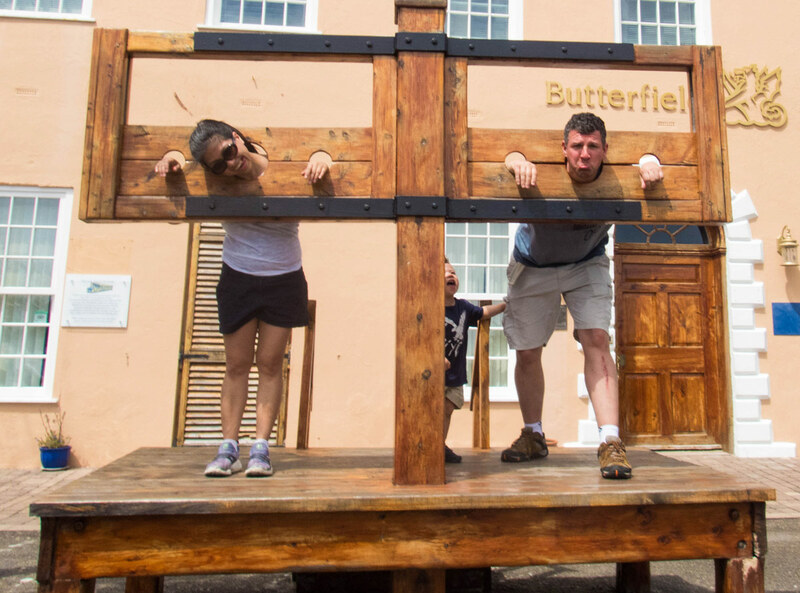 The backdrop to the pillories is the Bank of Butterfield, one of the oldest banks in Bermuda. The building was built in 1776 as a mess for the British Army. Fun fact: it was the first bank in Bermuda to introduce the chip technology. At the east end of the square is the St. Goerge Town Hall, which is the seat of the civic government. The interior is heavily decorated with Bermuda cedar, a gorgeous wood that is native to the country. Admission is free and it is even possible to have a seat in the Mayor’s chair! Pro-Tip: Visit the Bermuda, the Bermuda Bound Facebook page for great tips and resources. After taking way too many photos of the boys using the pillory, we left the St. Goerge Town Square and wandered along the many alleyways of St. George’s Parish. I really liked how colorful the buildings were. 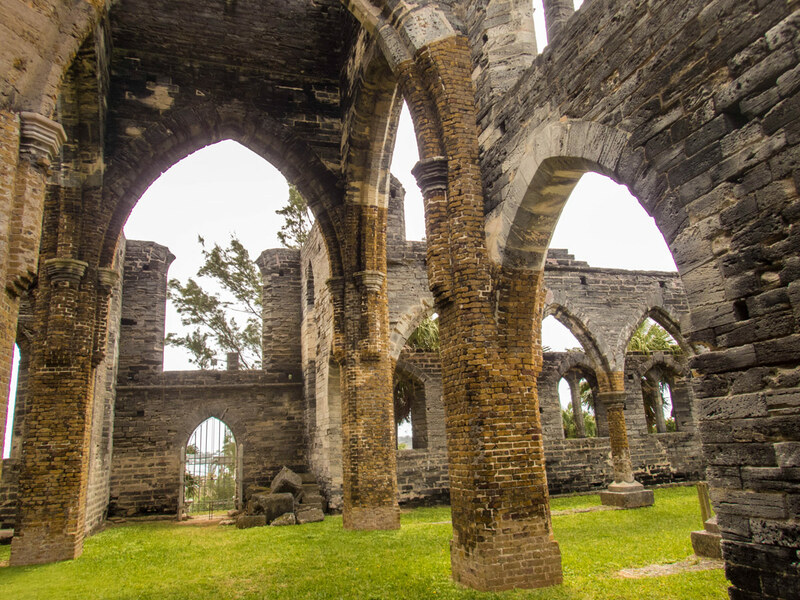 We finally reached the one of the most famous St. George Bermuda attractions, the Unfinished Church. The Unfinished Church Bermuda was originally built as a replacement to St Peter’s Church which was badly damaged by a storm. However, due to disagreements between the parishioners, the church was never finished. Now it stands as a shell of walls with no roof. It’s a popular spot for weddings in Bermuda. The rustic walls offer a stunning backdrop for photographers. Pro-Tip: The Unfinished Church is close to a busy road so families visiting with children have to keep a close eye on little ones that like to wander away. When we visited the unfinished church was closed due to its structural instability. However, the church has large windows so it was possible to see inside and get a good view of why it is so popular. The unfinished church is on a hill and it is hard to miss when visiting St. Georges. It is also one of the most photographed structures in all of Bermuda. With all the walking and hot sun beaming down on us, we were in need of some relief from the sun. 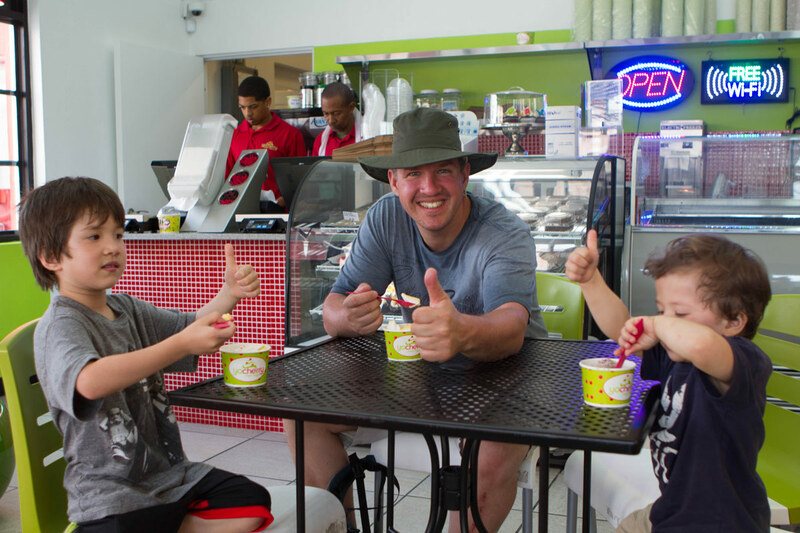 It was definitely time for some much-deserved ice cream. Just across from the Unfinished Church is a small frozen yogourt stand, A perfect spot for a break. 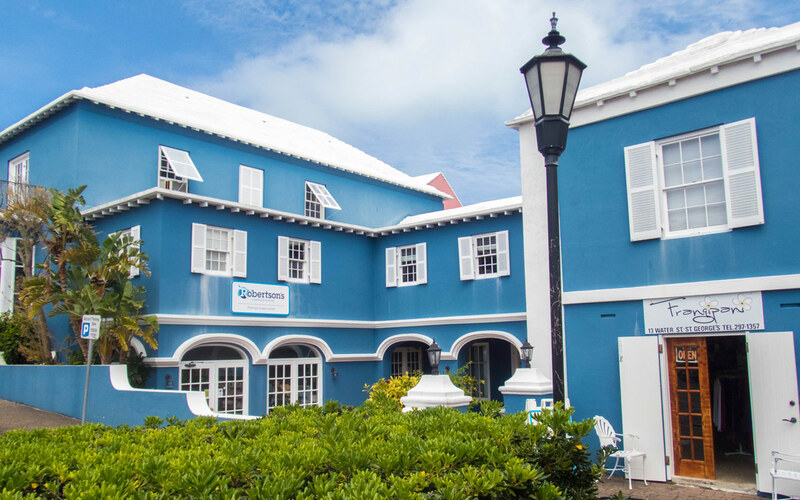 You can find the best prices and availability for hotels in St. George Bermuda on these websites. After having seen some of the best of what St. George Bermuda has to offer we decided to head up for some time at the beach. 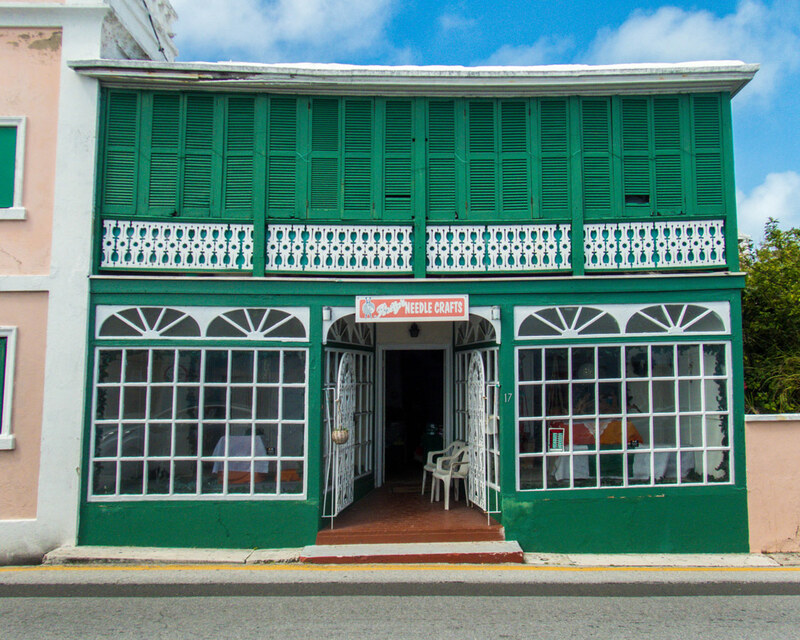 Since the ice-cream shop was across from the Unfinished Church, we walked up Government Hill Road towards Barry’s Road from where there is access to the beach. As it was off-season, there were only a handful of other people there. We were sweaty from the walk and looking forward to jumping in the Atlantic ocean. The locals couldn’t understand why we would want to jump into such cold waters. But even at 19°C, the water was just perfect for us. You can read about all of our favorite Bermuda beaches here. As we were in Bermuda during the off-season (we visited in March to escape the Canadian winter) the facilities at the resort were not open. Normally, there is a restaurant and a store from where you can rent equipment for water-based adventures. We did see other people that brought their own kayaks which they launched from the beach. Luckily, even though the resort was closed, washrooms were still accessible. Additionally, there is an outdoor shower and faucet. Since we brought some drinks and snacks with us, we were all set. The rock formations were truly a sight to behold. 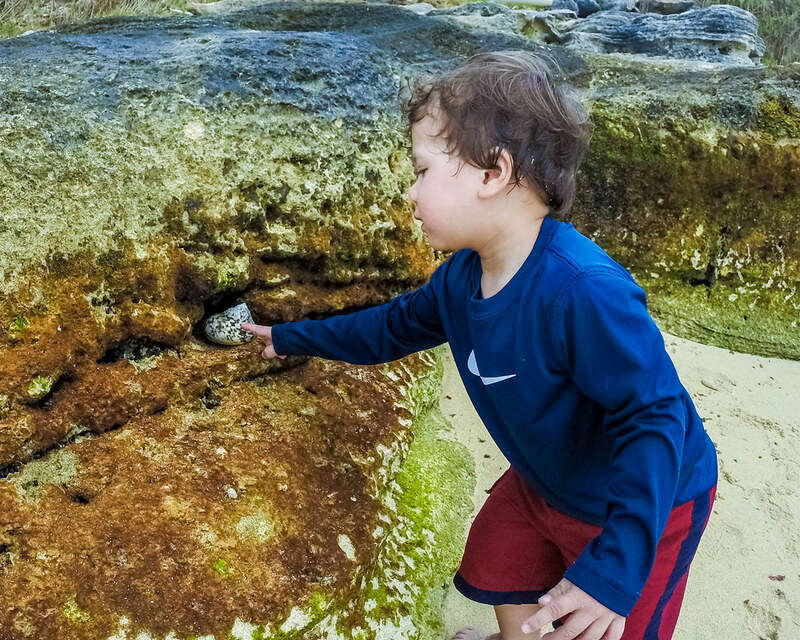 C enjoyed looking at the crevices surrounding Tobacco Bay Beach. He wandered everywhere trying to spot any tiny creatures that could be hiding from his prying eyes. The water is very shallow and calm. Combined with the sandy bottom, the boys had no issues walking out into the bay. We had brought our own snorkeling gear as we had read that Tobacco Bay is one of best places to snorkel in Bermuda from shore. And there were many parrotfish and other colorful varieties to see. Many of the fish in Tobacco Bay Bermuda though are out beyond the rocks where things get a little deeper or wavier. So, Kevin swam out a bit further beyond the protection of the rocks. True enough, he saw a many amazing fish. And of course, the cool rocks that make Tobacco Bay Beach so famous. 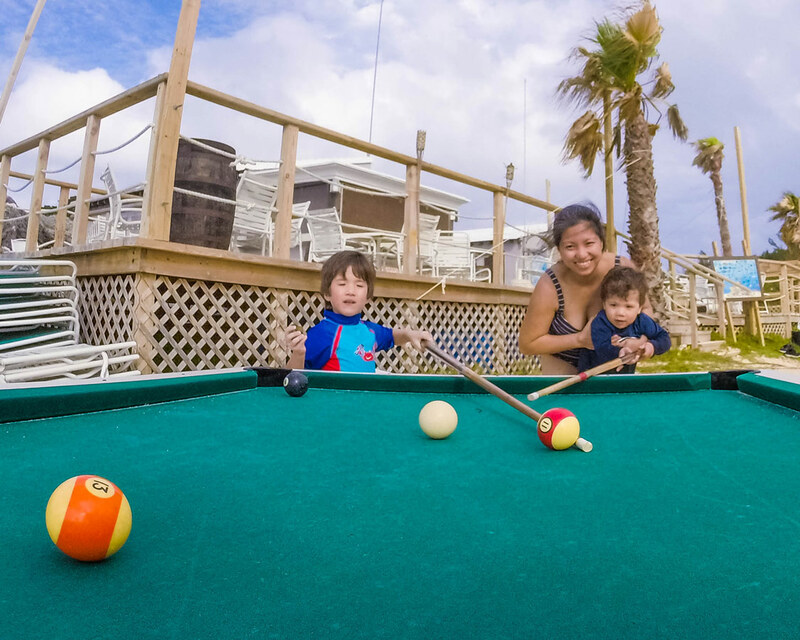 Once we had enough of the water we relaxed for a bit by building sand creatures and having a friendly game of outdoor billiards. It was a great way to spend our last afternoon in Bermuda. Before we knew it, our stomachs were grumbling in unison reminding us that it was dinner time soon. A quick chat with a local family also relaxing on the beach suggested Wahoo’s Bistro and Patio in St. Goerge. We were told it was a local favorite and it was walking distance from Tobacco Bay. So, after getting directions, we packed up our stuff and headed back into town. Wahoo’s Bistro was already half full when we got there and it wasn’t even 5 pm! 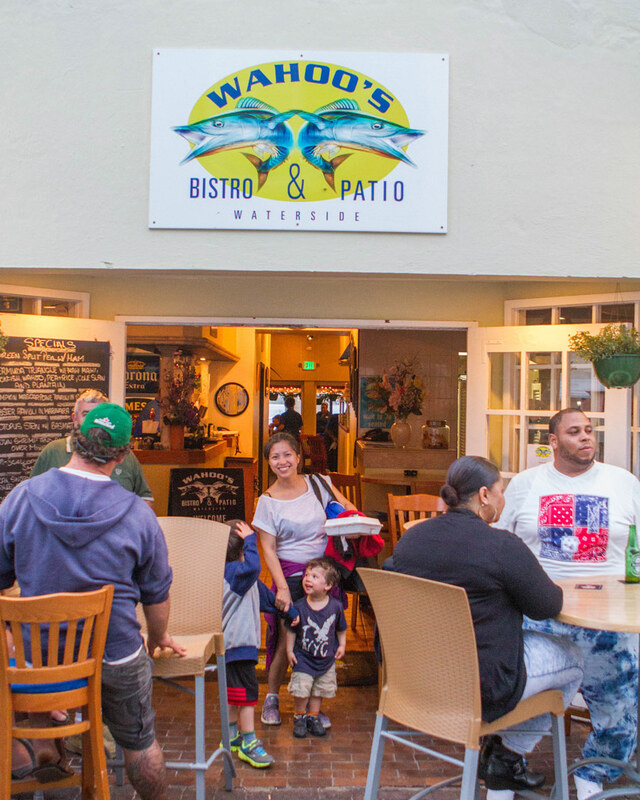 Wahoo’s Bistro is known for fresh seafood, notably lobster and various fishes. Kevin and I started by sharing an order of the Bermudan fish chowder. It came with a small bottle of rum which you can choose to add to your chowder – we added away! The children also tried the chowder (before the rum addition) but were not big fans of the “fishy taste”. For our main course, Kevin and I picked from the blackboard specials. Kevin had the blackfish and I had the wahoo. Both were delicious. The boys split an order of Weiner Schnitzel which came with fries and salad. And the serving size was very large and more than enough for the two of them! The service was quick and friendly. As we ate our meals we noticed that the restaurant was packed even though it was not yet 6 pm. We were glad we headed to Wahoo’s Bistro from Tobacco Bay beach early. 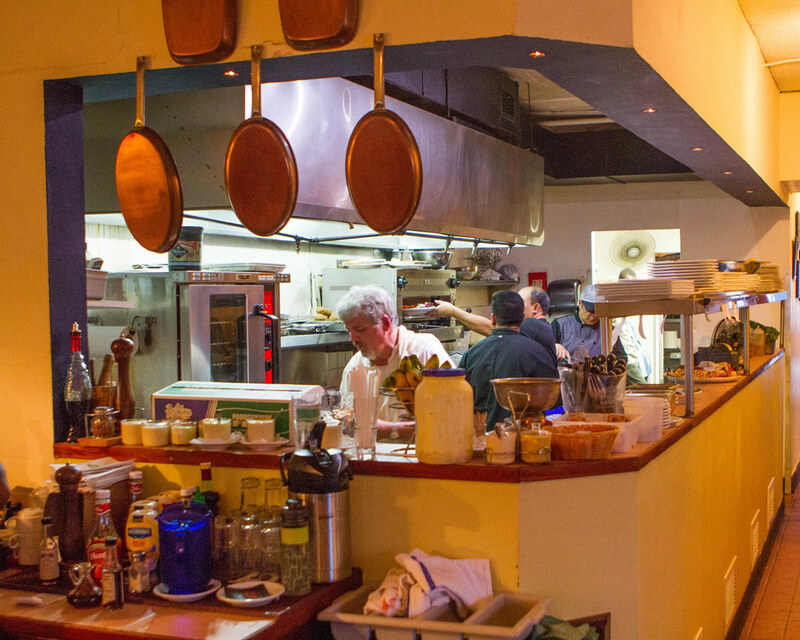 Tip: It is highly recommended that you make reservations if going to Wahoo’s Bistro for dinner. 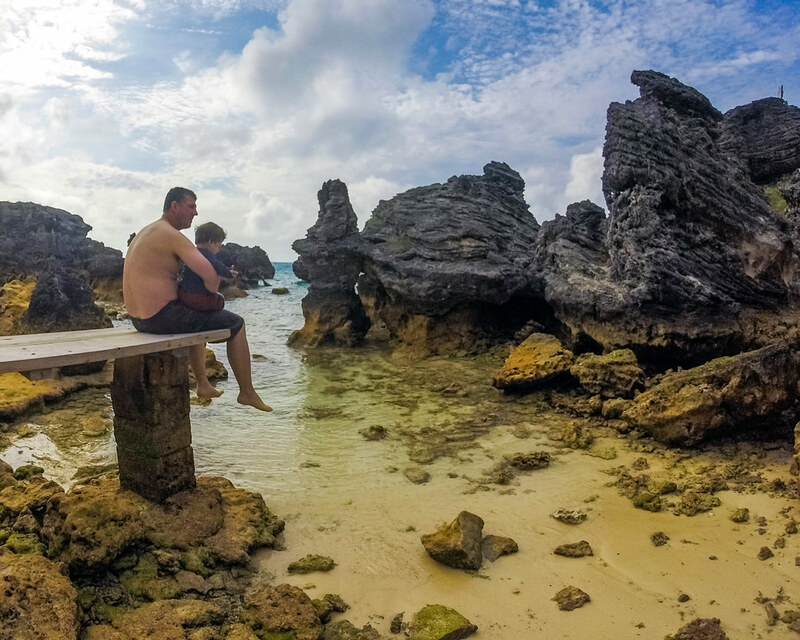 The town and the beach aren’t the only things to do in St. George Bermuda. Nearby Coopers Island Nature Reserve is an incredible place to visit. 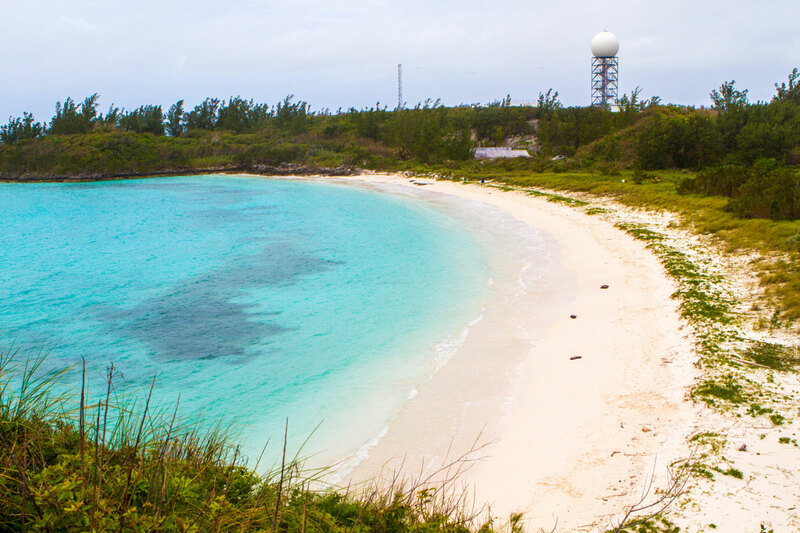 Coopers Island Nature Reserve is full of hiking trails, beautiful beaches, and amazing history. You can read more about Coopers Island Nature Reserve and Crystal Caves here. The famous Bermuda cave system, Crystal Cave, and Fantasy Cave are also attractions near St. George Bermuda. This gorgeous cave system is a must visit for those who love to explore the underground. 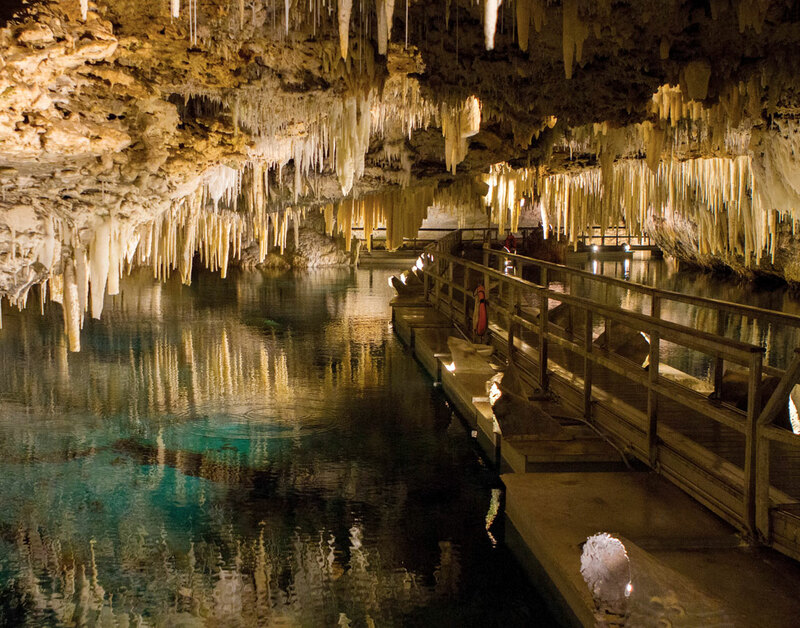 Check out our favorite caves to visit with kids here. St. George Bermuda is amazing to explore. From King’s Square to Tobacco Bay and beyond, there is something in Bermuda’s former capital for everyone. Do you have a favorite place in St. George parish? Share it with us in the comments below, or shoot us an email from our contact page and tell us all about it. Those photos of the pillories were so fun. Well, I mean interesting, it’s actually no fun in real life 🙂 Too bad they weren’t doing any shows since it was off-season, but still cool that you got to see that. 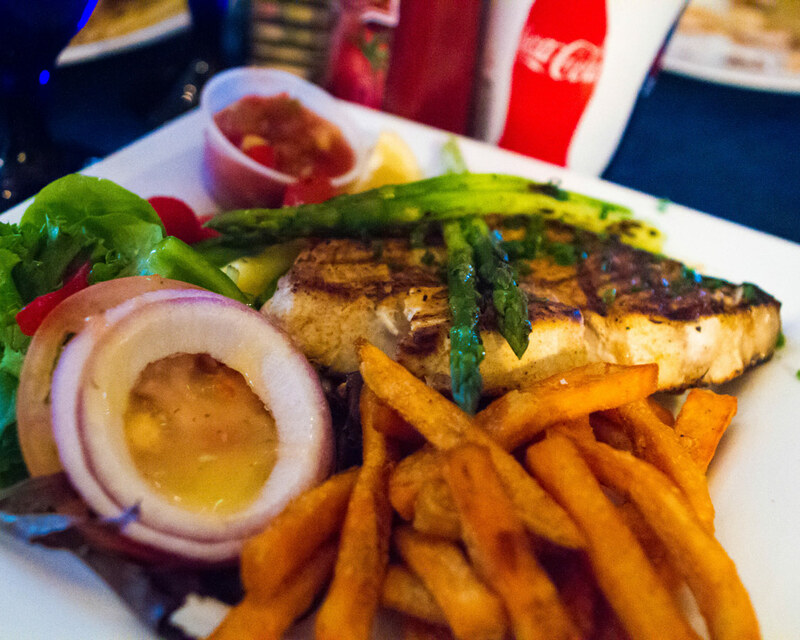 The food at Wahoo’s Bistro and Patio looks amazing. Good thing you got there before it got super packed. It’s never fun waiting when you are hungry! St George looks so neat. I would love to see the unfinished church, it looks like a ruin. first of all I would like to say only one word. ‘Amazing’ I have never seen such a beautiful place in my life! I would love to go there someday! thanks for sharing guys! Cheers! It is such a stunning place to visit. It’s pretty easy to see why the locals love it so much! The churches look beautiful, even the unfinished churches are lovely. What a rich and interesting history of the buildings. Off-season still looks like a great winter getaway for beach time. Although you mentioned you went during the off-season, it looks like you had so much to do in Bermuda! I loved the bistro’s pictures. Had not heard of Tobacco Bay before. Great to know that snorkelling is great here. 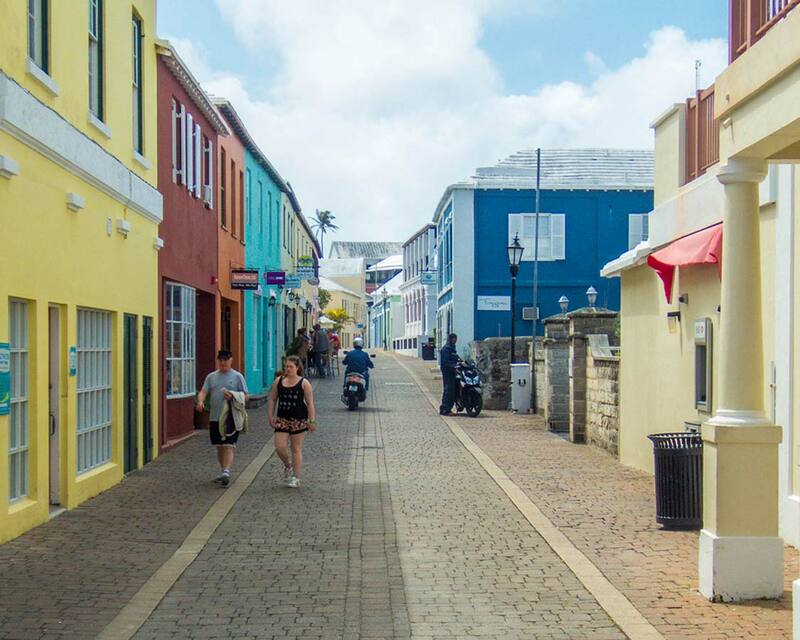 I didn’t know much about Bermuda before but I was surprised at how colourful a town St George is. The kids looks like they’re having a great time, as usual! Would you recommend visiting in the off-season? Look at that lovely blue town house – what a quaint little town this seems to be. Bermuda is def on my list and this is saved for whenever I make it there! Weiner Schnitzel looks amazing. I am already wanderlusting for st george’s! Wow I didn’t know this city had the UNESCO World Heritage label! I love UNESCO sites and by the looks of your photos, I would love this place. The bright green and blue doors are so pretty. I didn’t realize March would be off-season for Bermuda. I went to the Caribbean in February and it was high season for many places. When would be high season for Bermuda? Anyway, I love the colorful houses and the pillory. It seems like a great place to visit. It is a wonderful place to visit for sure. High season in Bermuda is May – October. It is located off the coast of North Carolina so it is closer to the US than the Carribean. It is technically part of North America. I’d never heard of the Unfinished Church before, but it looks awesome! Bermuda is high on my list because it’s such an easy flight from Boston, so thanks for these tips. Such beautiful photos! You really made me want to schedule a trip ASAP. I too would gladly dive in 19 C waters. Especially now. Because we have been living in 102 a day heat here in Chiang Mai and need a pool or ocean or something other than a somewhat cool shower LOL. Love the island vibe I feel from reading your entertaining post.